Essential plot rundown: An ugly man lives in the cellar of an opera. 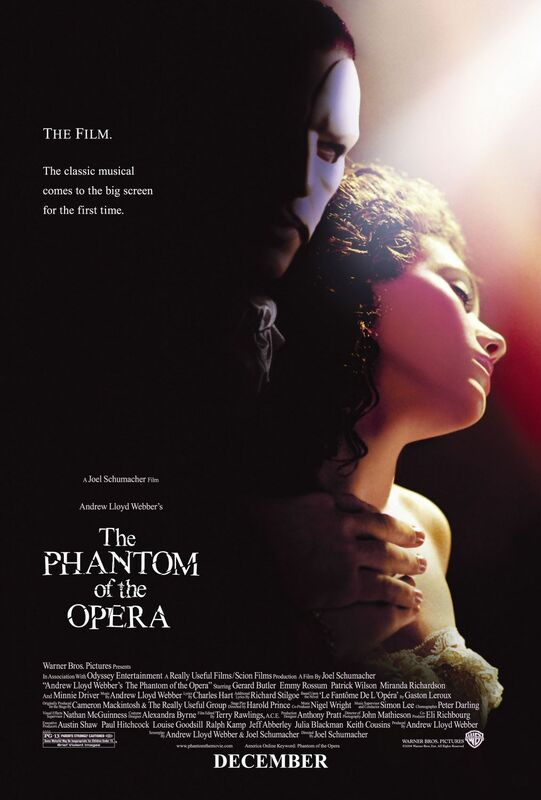 So, I'm taking an English class right now and we are studying The Phantom of the Opera; we had to read the novel and see the play produced by our theatre department. And I figured that I might as well and finish it off by watching the movie. Let's start off with the biggest thing that bothered me; I also had the same complaint with the stage production. The story moves by too fast and there is no character development. I don't get to know any of the characters; I don't root for either Raoul or the Phantom. I didn't make any type of connection with the characters. I'm not invested in the story. (Though, one thing the movie did that the play doesn't is explore the backstory of the Phantom a little more). I didn't really care about what was happening on screen. I spent a lot of the time talking with my roommates, only stopping when a song came on. And that is (obviously) the main thing of the move: the music is awesome. All of the main songs are incredible. There are a couple of filler songs that feel like filler; while not bad, they don't compare to the others. My favorite song is the overture at the beginning. I can listen to the soundtrack whenever. I had the subtitles on because it was noisy in my apartment and I found myself singing along half of the time. But, I did like how they converted it from a stage production to a movie. It was interesting some of the things they kept. The part where they are in the boat and the candles rise up out of the floor (water) was pretty cool. But, by far my favorite part of the movie was the transition at the beginning. Like I said, the overture is my favorite song and I loved seeing the opera house change from being old and run down to brand new. I didn't think they were going to show that change. And it was cool to see the transition; they did it in more of a play-style than a movie-style. But, yea, I loved that part; I watched it again after the movie was over. So, overall it's not a bad movie. What it lacks in story and character development, it makes up for in music. Which, is all you can really ask for with a musical, I suppose. It's worth checking out sometime.